BAJHANG/MUGU, Dec 13: Snowfall and moderate rainfall was what the farmers of the high hills in Bajhang and other mountainous districts were desperately waiting for these days. They were in dire need of these for their crops like maize, wheat and barley to grow. On Monday and Tuesday, they were blessed with the same. “Our winter crops were not growing well in lack of water. We were hoping for rain and snowfall at the earliest and it happened. 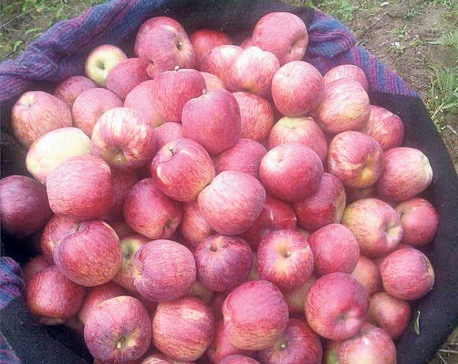 We are overjoyed,” stated Kalak Bohora, a farmer from Kanda Rural Municipality-3. Enough and timely rain keeps the soil moist and assists in increasing productivity. At the same time, delay in rain incurs heavy loss to the farmers. “Over 150 farmer families live in this municipality. All of us have cultivated maize, barley and wheat. If it had not rained these two days, we would have to bear heavy loss,” he said. Farmers term timely winter rain as ‘nectar’ as it turns their farms green within few days of receiving rain. This gives them a sense of satisfaction and fulfillment. “We won’t have to rely on the government’s grain quotas to survive this year as winter rain means, we will have good harvest,” Joshi said. Senior agriculture officer Rajesh Kumar KC stated that the few days back farmers were worried seeing their crops drying up. “They are really very happy,” he said. According to him, over 28,000 hector land in the district is suitable for growing winter crops. Of this, only around 6,000 hector has irrigation facility. “Most of the arable land in the district does not have irrigation facility. So, rain is very essential for crops to grow,” he said. High hills of Mugu district received snowfall from morning to evening on Monday. This has created a spectacular view in those locations. Farmers have welcomed the chill though this has hit normal life of the people. Snow moistens the soil triggering fast growth of the winter crops. 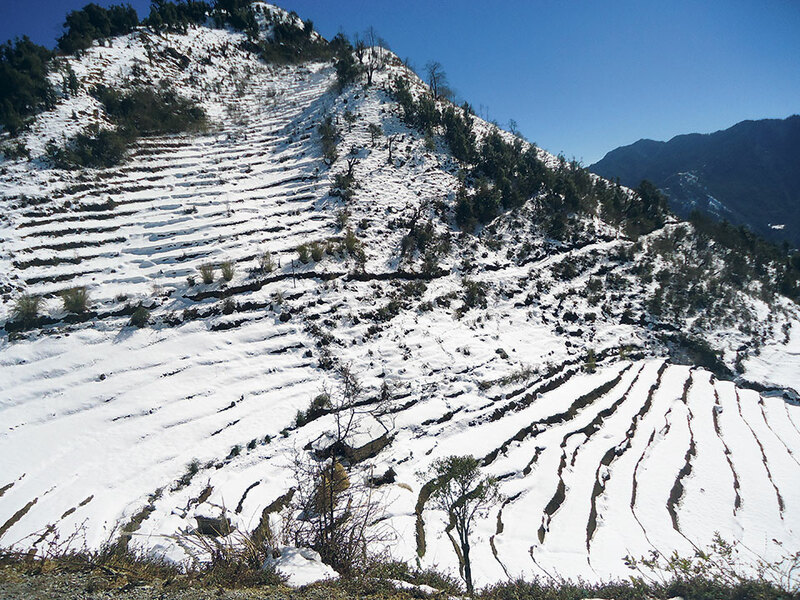 Gorlal Bohora of Rara Municipality said that the snowfall has elated farmers though the growing cold has forced many of them to migrate to lower hills. “Because of the snowfall, the chill is becoming unbearable by the day. Because of it many of them have left for warmer areas downhill,” he said. Easter part of the district received the maximum snowfall. Dolfu, Chitai, Kimri, Dhanaikot, Serog and Daura, among other villages, were covered with white snow. “With the snowfall, schools have been closed. Farmer families have migrated to warmer areas along with their cattle,” Bohora said. “Though the snowfall has affected the day to day life, as farmers it is bliss for us,” he added. Though residents in high hills of Mugu usually migrate to warmer areas, this year they had to stay for participating in the provincial and parliamentary elections. Chhorten Lama of Mugu village, the completion of the election has also given them reason to pack up and get down to the warmer areas. “We were waiting for elections to conclude. Since it was held successfully, we felt relieved,” he said. 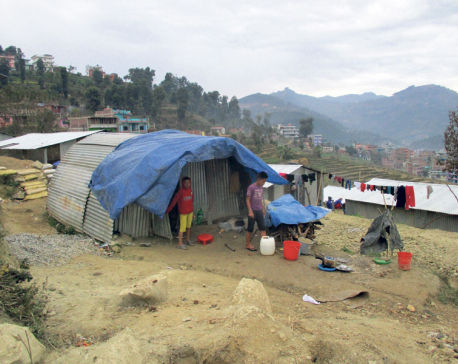 Lama shared that people generally move to Siranichaur, Pipledi, to district headquarter Gamgadi and some even go to Kathmandu to escape the cold. According to DSP Bhim Kiran Bogati, the growing chill has given tough time to security force deputed in the border areas. He shared that special management is made in most sensitive areas. “Now, the chill has started to bother security personals deputed in high hills. When it the cold becomes extreme, even security personals are called to safer, warmer zone,” he said. “The snowfall is just the beginning. With every passing day, it will become colder and colder here,” he added.